expand the trade zone to cover region ABCD to increase region A freshwater volumes to exponentially increase good production to cover regions ABCD further to satisfy the whole world. Map of the cumulative tracks of tropical cyclones during the 1959–2005 time period, the main sources of renewal energy and freshwater. The Pacific Ocean west of the International Date Line sees more tropical cyclones than any other basin, while there is almost no activity in the South of the Atlantic Ocean, south of the Equator. 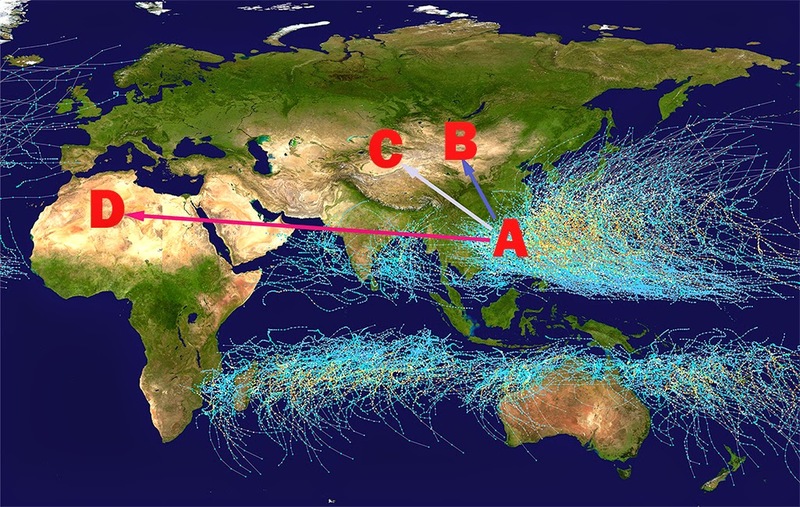 Nearly one-third of the world's tropical cyclones form within the Western Pacific. That makes this basin the most active on Earth. Pacific typhoons have formed year round, with typical peak months from August to October. The peak months correspond to that of the Atlantic hurricane season. Along with a high storm frequency, this basin A also features the most globally intense storms ever recorded with most continental freshwater falls and can be stored in high altitude of the tropical landlocked country, Laos, ideal for mass production of all kind of goods.